I have joked about it, but am really beginning to believe it. I think God vacations in Sarasota. We say that because for at least the last 100 years, despite occasionally insistent predictions of the meteorological community, our area has avoided any significant impact of a major hurricane. While we had some minor flooding and a ton of yard debris, Sarasota's experience with Hurricane Irma remains consistent with that of her predecessors. Last week, as we were preparing for this Category 4 killer, I wrote about an experience I had coming across a beautiful rainbow over my neighborhood. In that post, Pinning Hope on a Rainbow, I reflected on it being a possible sign that our community would be alright (I considered naming this follow up post “Winning Rainbow Power”, but with current trends thought that could be wildly misconstrued). I also said that whatever happened, I was really hoping to end up on the west side of the eye. That is the weakest sector of any hurricane. As it turned out, the rainbow correlation was a correct one. Once again, we dodged a major bullet from Mother Nature. It took an eastward jog taking the eye east of our area, and once past, turned westward and picked up the predicted track at the coastline. And it was not the first storm to do this. 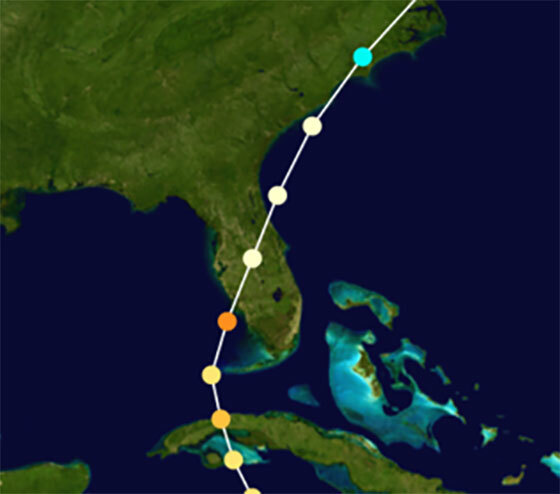 In 1960, killer storm Hurricane Donna made landfall at Ft. Myers about an hour and a half south of us. Forecast to head north, she turned just south of here and went across the state. She killed 364 people on her angry march all the way to the northeast, but none of them were here in Sarasota. In 2004, Hurricane Charlie approached the Florida west coast with Sarasota square in his sights. 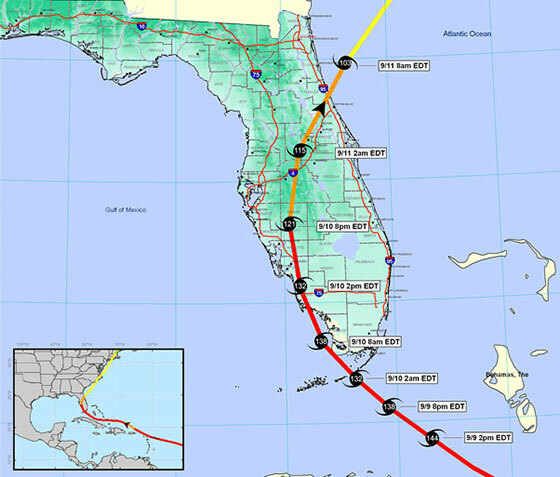 Sarasota was the unquestioned point of landfall in the final few hours before that event. Suddenly, it took an eastern direction 45 miles south of here, heavily damaging Port Charlotte, FL, inland to Orlando. Once again, we were spared. I think you can see that no other explanation would suffice. We can only assume that God vacations here, and keeps batting these things away to keep his favorite city and preferred beaches pristine. Yes, that makes perfect sense. And even if you are somewhat dubious of this declaration, there were other useful things I learned up to and beyond Hurricane Irma that you may find useful. Ok, some of these things I knew already, but this was a great opportunity for a reminder. People are Essentially Good Souls: There is so much negativity in the news today that it is easy to forget, but most people are truly good and caring folk. Given the opportunity, they want to and will do the right thing. During the stressful prep, as we anticipated the worst from what was a truly dangerous storm, helpful and friendly people were in abundance. In several of my trips to The Home Depot and elsewhere, I engaged in discussion with people offering useful tips and ideas for protecting each other's homes. I got the opportunity to help a woman who couldn't reach a stack of remaining 2x4's, while the store staff was genuinely in the weeds and unavailable. I was able to stand on another stack of wood (wood was scarce – so it is worth mentioning no one pulled it out from under me) and got down the 14 pieces her boyfriend told her they needed. She was very appreciative and wished me well. In fact, everybody wished everyone well. Everywhere I went, people almost jovial with sense of community told perfect strangers to “stay safe” and wished them luck. People with extra wood and supplies used social media to share that with their friends. Neighbors checked in with neighbors, and offered assistance to help make sure everyone was prepared. Long gas lines formed, but there were none of the fights you heard about on the evening news. Some people even risked their lives by venturing into an empty Sarasota Bay (advancing winds pushed much of the water out) and saved two Manatees who had been stranded by the quick outflow. They rolled them on to tarps and dragged them almost 100 yards to get them back in the water. It may not have been that way everywhere, but the people of Sarasota County certainly made me proud to call this place home. Florida State Agencies and Utilities Rock: The advanced preparation of our state government, and what has been described as the largest mobilization of utility workers in history made an enormous difference for citizens of Florida. Florida Power and Light had thousands of workers from as far away as Wisconsin and Oklahoma in various staging areas in anticipation of the damage this storm would cause. Even though we were spared a hit from the eyewall, we experienced 90 plus mile per hour winds, and 75% of Sarasota County lost power. I was thrilled to have our power back in just 23 hours. It will take longer for some, but statewide they are facing an enormous challenge, and facing it well. Hats off to FPL and Governor Rick Scott, who was seemingly everywhere in advance of the storm. When You Have Loved One's In Danger, Offer Support but Don't Expect an Answer: My wife and I were blessed with many, many (MANY!) people reaching out to ask if we were ok. We truly appreciate the love and support that we received. However, having done the same for others in the past, I really learned something with this. I would recommend sending messages of support, but make it clear you don't need an immediate answer. Prepping for a major storm is difficult work, and having your phone continually beep with texts, emails, Twitter and Facebook messages, all while you are on a ladder trying to board up your house can be a distraction. I did have one person from Texas send me an email telling me of prayers and well wishes, who said “You do not need to respond to this”. I did briefly respond, but truly appreciated the acknowledgment that immediate preparations were paramount. I will be doing the same for friends facing danger in the future. Weathermen are Blundering Idiots: Ok, that may be a little harsh, but I am annoyed that the amount of glee they experience seems to be directly tied to the severity of the storm and its potential damage. Also, does one of these dunderheads have to be decapitated by flying debris on live TV before they stop their ridiculous on sight reports? Not to mention, they clearly have not mastered the science of forecasting. Scientists may believe they can predict the temperature of the earth in 100 years, but they have absolutely no clue which beach they should be standing on today in order to show us why we should not be standing there. When everyone was sure Irma was going to savage the east coast, national television meteorologists rushed to strategically dangerous places. For twenty four hours prior to landfall we were informed of every rain drop, and at one point were glued to our sets when they excitedly announced that there was a puddle in Miami's Brickell District. Here is a clue - with their rapid growth Miami has done a terrible job of planning when it comes to drainage and flood abatement. There is always a puddle in the Brickell District. The reality became that, except for the Keys and Marco Island, which were heavily damaged, areas of the east coast still took the brunt of the storm (they were, of course, on the bad side of the eye). Through it all I got the feeling that the weathermen were just guessing their way through this. I will give kudos to Tampa Fox 13's Paul Delegato, who seemed a more tempered voice through this (we had a lot of time to channel surf). 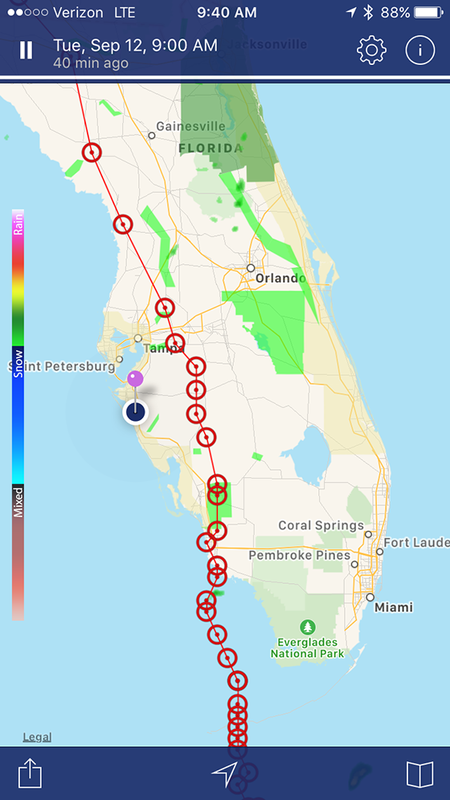 He was also the one who said, as the storm headed north from Marco Island, that the “national weather service is wrong”, and predicted that the storm would shift east and spare the Tampa Bay region. Maybe he was watching rainbows, or has God's cell phone on speed dial. Finally, I have a few “thank you's” to get out. I want to thank all those people who did reach out and express concern for our safety. It was truly appreciated. I want to thank Texas Workers' Compensation Commissioner Ryan Brannan and IWCF Executive Director Eric Oxfeld for their support and understanding. This storm caused me to miss a speaking commitment at the Texas DWC Conference, and their understanding of the situation was greatly appreciated. Also thanks to Mark “RxProfessor” Pew, who stepped in at the last minute to fill my absence. 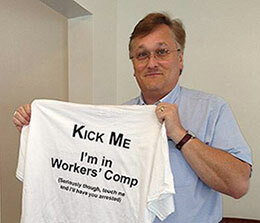 I also wish to thank my associates at WorkersCompensation.com, who despite mandatory evacuations and other hardships caused by the storm, worked to keep in touch with one another and support our customers remotely in the process. And I absolutely want to thank God, for vacationing here in the place I call home.